You may hear the terms tantrum and meltdown used synonymously, but did you know that they mean different things? 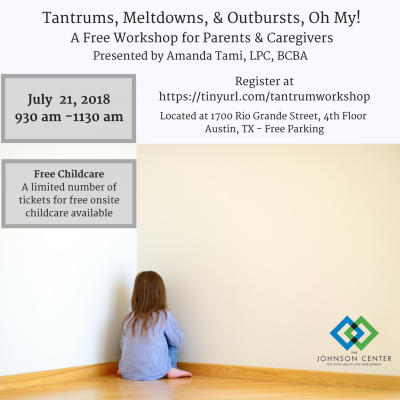 Join us for a free workshop for parents and caregivers and learn the differences, as well as strategies to effectively handle both. This workshop will be presented by Amanda Tami, LPC, BCBA and there will be a small group discussion following the presentation to answer questions and provide additional resources and information. Free childcare and children’s activities will be available on site for a limited number of participants. Children ages 2-12 will have the opportunity to participate in games, crafts, and activities under the supervision and guidance of staff and interns from The Johnson Center. (To sign up for the children’s activities, select a child’s ticket for each child who will be in attendance).